​July 4, 2018 will see the 100th anniversary of the World War One Battle of Hamel, fought on the Somme on American Independence Day, an Allied victory, achieved in a staggering 93 minutes, which introduced tactics that dramatically turned the tide against the Germans and changed the way that war is fought. 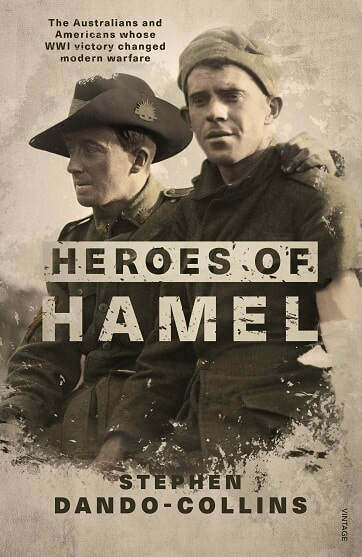 The battle of Hamel was remarkable for its speed, the tactics employed, numerous acts of extreme bravery, and the fact that for the first time in history American troops fought under Australian command. · General John Monash, a former Melbourne engineer who had risen through militia ranks to become the first Australian corps commander of WWI, and who put his career on the line by conceiving and commanding the bold Hamel assault, implementing it despite the reservations of his British superior and the interference of American commander General Pershing and Monash’s own Australian prime minister, Billy Hughes. · Australians Private Henry Dalziel and Lance Corporal Jack Axford, who both won the Victoria Cross (VC) for their gallantry during the battle, and Sergeant Ned Searle (who is related to Stephen Dando-Collins), who set out to win a Victoria Cross during the battle. · Colonel Joseph B Sanborn, at 64 supposedly much too old for front line service, yet who, as commander of the American 131st Regiment, defied the orders of US commander General Pershing to lead his men into battle alongside the Australians. On General Monash’s recommendation, Sanborn was awarded the British Distinguished Service Cross (DSC). · American Corporal Thomas Pope, who won America’s highest gallantry award, the Medal of Honor (MOH), for his part in the Battle of Hamel, becoming the first member of the US Army to be awarded the Medal of Honor in World War One. Pope would live to 94, becoming the last WWI Medal of Honor winner to pass away.